The carnivore diet – also known as the all meat diet or the carnivorous diet – entails eating almost nothing but meat for every meal, every day. That means a lot of protein, a lot of fat, and almost zero carbs. This runs contrary to conventional nutrition wisdom, such as “you need to eat a lot of vegetables, fiber, and grains,” which has contributed to the proliferation of vegan and vegetarian diets. You’d expect the carnivore diet to cause high cholesterol, digestive problems, weight gain, and other problems. However, conventional wisdom is not always perfectly accurate. It was hard for me to wrap my head around the idea that the carnivore diet could not only not cause harm, but actually improve my health. However, after seeing people share positive results they achieved with it, I decided to run an experiment to see if it would actually work for me. And, since I enjoy the taste of eating meat, it seemed like a diet that could be sustainable. 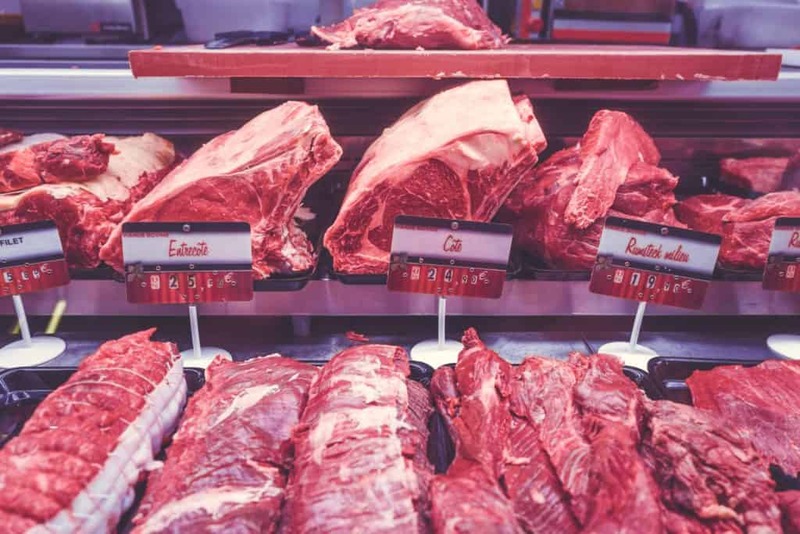 In this article, I’ll cover the basics of the carnivore diet, the practices that helped me survive the first month on it, the impact it had on my health, and why I chose to discontinue it. You can also eat some zero calorie foods such coffee and spices. I included Bulletproof Brain Octane Oil (MCT oil) as well. The foods on the list above contain almost zero carbs. Unlike paleo and other low-carb/high-fat diets, the carnivore diet does not include vegetables or nuts. Let me start with some important caveats. First, I’m not a doctor or a nutritionist and this is not medical advice. Second, everyone’s body is a little bit different and will respond differently to different foods. Third, I have very little confidence in the data we have about the validity of any diet, including the carnivore diet. 1. The first thing that attracted me to the carnivore diet was the menu. I like meat and other fatty foods and don’t have too much of a sweet tooth anymore. Therefore, it seemed like it would be easy for me to maintain. 2. Eating little or no carbs causes your body to go into ketosis, a metabolic process of using stored fat for fuel. Ketosis has been linked to many benefits including reducing symptoms of mental health issues such as ADHD, weight loss, and strength gain. 3. Sometimes moderation doesn’t help. A taste of sugar might make you want a lot more. Sometimes it’s better to have no sugar at all than it is to have a little bit. I experienced strong cravings for the first ~2 weeks, but they subsided significantly after that. When I’m on a standard low-carb/paleo diet, I typically eat “cheat” meals at least once per week. On the carnivore diet, my cravings for that cheat meal subsided significantly. In fact, I stuck to the diet strictly for an entire month. 4. I lost four pounds in the first week, and then two more pounds in the following three weeks on the carnivore diet. However, this wasn’t a goal of mine. I wouldn’t consider myself overweight and I don’t have any reason to work towards becoming “skinny.” This was the main reasons why I stopped. I faced a few challenges when starting the carnivore diet. I’ll discuss four of those challenges and how I overcame them. By being aware of these potential challenges and having a plan for overcoming them, they will be easier and less stressful to handle if you experience them. 1. Get your blood tested before you start and again a 2-3 months after so that you can measure the effects. Talk to your doctor or a nutritionist before trying anything you read about on the internet :). If/when you decide to try it, take note of any changes in your energy, digestion, weight, etc. Everyone is different. While small samples of people have reported benefits from the carnivore diet, I’m sure there are others who it could cause problems for. 2. The first week was the hardest. Expect fluctuations in your appetite, energy, and focus levels. Get started on a week where you’re not too busy. Work remote. Take time off. Under schedule yourself. Give yourself time to sleep a little more. 3. A few days after I started, I lost my appetite for steak. I’m not sure if it was because I bought a bad cut, or cooked it wrong, but, as you can imagine, not having an appetite for steak while on a diet that consists primarily of steak was pretty challenging. Cheese helped. I ate a lot of it in the first week hah. Keep it stocked in case you need it. If you’re going to cheat – and I did on that first week – try eating something that’s not too far from the diet, such as peanut butter. While peanut butter is not part of the diet, it’s not as bad for you as something like Twinkies, and it’s really tasty so it can help you overcome cravings for something much worse. 4. Be prepared for swings in your appetite. Some days I would go several hours without being hungry at all. Other days I would randomly be starving for a huge meal at 10am (after eating breakfast), a time when I used to never be hungry. My appetite leveled out after the first few weeks once I found the right portion sizes to eat throughout the day. Until you find yours, make sure you have access to carnivore friendly food throughout the day. I had a lot of questions about the diet and I’m sure you do, too. Did you experience digestive problems? I had expected that a diet doesn’t include vegetables or virtually any fiber would cause digestive problems. I’m not going to go into the detail of my experience for obvious reasons, but I will say that the small (far less significant than when I first started on a low-carb diet) disturbances in my digestion that I had been experiencing almost completely went away. And after I stopped the carnivore diet, they came back. In short, no, I didn’t experience any digestive problems. If you’re not eating a lot of junk food, you might not need a lot of fiber. This is a goofy analogy but I’ll use it anyways: Tylenol might be helpful to someone experiencing neck pain, but might not be helpful to someone who’s not experiencing neck pain, or could potentially even cause some negative side effects. Isn’t red meat bad for you? Like many things in nutrition, and in life, you have to consider the other variables at play. If you don’t exercise and eat a ton of sugar, and red meat, you’re probably not going to be very healthy. But if you eat red meat, exercise, avoid sugar, and eat other healthy foods, you’ll probably be in pretty good shape. There’s debate that meat/fat causes high cholesterol. There are many variables that affect cholesterol, and everything in our bodies for that matter. If you are eating a lot of fat AND sugar, that is very different than eating a lot of fat without the sugar. It could be the sugar that’s causing the problems, not the fat. Correlation does not equal causation. Exercise is another important factor. There’s even debate that cholesterol is bad for you, but I’m not qualified to understand or present those arguments. I don’t have confidence in the research that’s been done to determine the best nutrition for the average person. I don’t have confidence in the food pyramid OR the carnivore diet. In addition, everyone responds a little bit differently to different foods and has different lifestyles. We’ll get better data eventually though. There are some really smart people working on this stuff. In the meantime, an n=1 experiment (trying it for yourself) is a good way to start learning what works for you. Do your own research before starting. Consider your pre-existing health conditions and consult your doctor and a nutritionist before making any major changes. If you decide to try it, measure the results quantitatively and qualitatively. After the first week, I found it pretty easy to maintain. However, I stopped because I was losing weight, which isn’t a goal of mine. I probably could have changed this by forcing myself to eat larger portion sizes and/or scheduling my meals differently, but, frankly, I enjoy some healthy carbs, such as sweet potatoes, and my blood tests didn’t give me any reason that I needed to give them up. I still maintain a low-carb, high-meat, high-fat diet.